All are dolls clothes are made by hand and are unique creations. They are fitted to the 18 inches dolls. 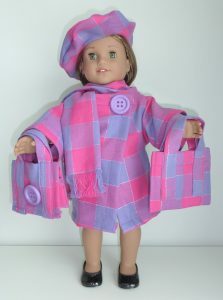 Tartan pattern coatScottish tartan pattern coat with scarf, beret and 2 totbags.For the American Girl doll. 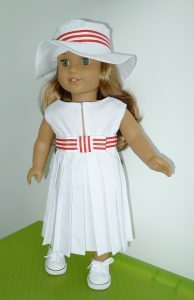 Dress with creaseWhite tennis dress with crease and a capeline, a beret and a handbag.For the American Girl doll. 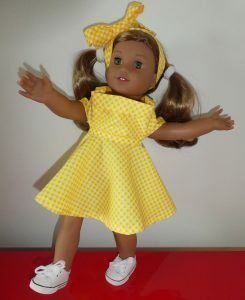 Yellow dot dressCocktail dress.For the American Girl doll. 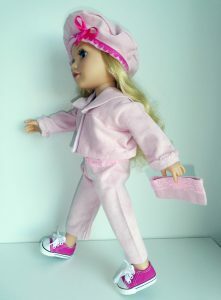 Velvel overallPink velvet overall, jacket, pouchbag and beret.For the Journey Girls doll. Skirt and pink jacketPleated skirt with pink summer jacquet.For the Journey Girls doll.